Any experienced rider knows the importance of a proper fit. If your jacket is a little too tight, that can affect your freedom of movement. If the sleeves are too short, that can cause an annoying distraction. If your leather pants don’t fit right, that can affect the quality and safety of your ride. All this can be avoided, thanks to Vanson’s Custom Fit Services (watch our how to measure video). The reality is we come in all shapes and sizes and are not mythic creatures of perfect proportions…so at Vanson, we specialize in fitting individuals ranging from minor sleeve- and jacket-length changes, to full custom made-to-measure roadrace suits and everything in between. We offer à-la-carte pricing for simple changes and a flat fee for full custom. And when our Sizing Form is filled out properly and the built-in mathematical checks work out as specified, we guarantee your custom fit. Once we review your completed Sizing Form, we may determine that all you need is a slightly modified standard size – and that will save you some money. The point is, Vanson designers and fit professionals as well as Vanson dealers all have years of experience and are committed to your having a positive experience with us. 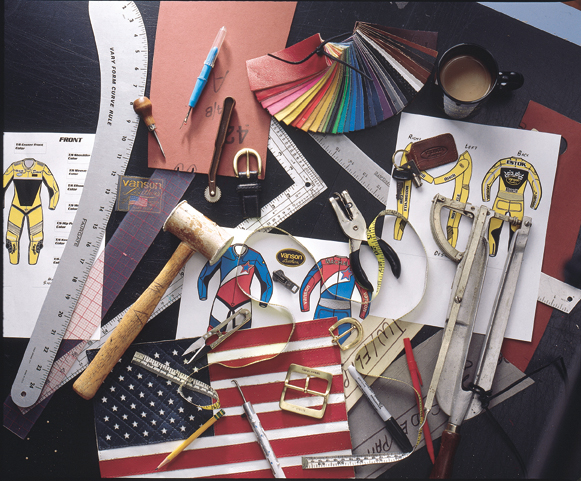 So, start with the Sizing Form, then ask your Vanson dealer for color swatches and our special measuring device. Then, pick out the style you want and put your order in. It’s that simple. Whether you are a rock star, intergalactic warrior, part of a team, or simply an individual who wants to create a look that reflects who you are, or would like to be, Vanson can make it happen for you. We offer full custom design services – with the in-house design talent and experienced craftsmanship to back that claim up. So, “Custom Design” at Vanson can mean anything from a made-to-measure existing style or your own personalized view. It might be as simple as your favorite color with a unique logo or emblem, or as complex as mixing and matching colors and imaginative details. Just send us an image of your artwork, we’ll scan it, and our computerized cutting machine will render it in leather down to the finest detail. At Vanson, we also specialize in team, departmental and club jackets and vests. So if you’re a team racer, motorcycle cop, or club member Vanson’s got you covered. You’ll see a number of custom designed leather garments throughout this website – unique designs worn by real people – created for functionality and legacy, with great care and pride, hand built one at a time in the U.S.A.. Since each custom designed piece is unique, each original design must be reviewed to determine its degree of difficulty and price. Your Vanson dealer can help guide you through the process or you can deal directly with us. Either way, one thing is for sure – you will always get your money’s worth - and then some.